Ever thought of making your own chocolate truffles? Here's a raw version, with agave syrup and virgin coconut oil, to enjoy every moment of your life. Prepare the coconut cream in advance: throw all the cream ingredients (shredded coconut, water, 200 g agave syrup) into the high-speed blender jar and blend on high-speed for a couple of minutes or until perfectly smooth. Let it rest in the fridge for 4 hours before using. Finely chop the chocolate and gently melt it over a bain-marie. Add 400 g of coconut cream (you can store the leftovers in the fridge for up to 4-5 days) and lucuma to the melted chocolate and stir well. Let the mixture cool down to room temperature, then let it rest in the fridge for at least 6 hours. Shape the truffles by rolling them between your palms, then let them rest in the freezer for about 1-2 hours. Prepare the chocolate coating (coconut oil, cacao powder, 40 g agave syrup): gently melt coconut oil over a bain-marie, add cacao powder and agave syrup and stir well. Dip the truffles in the chocolate coating right after you have prepared it, allow the excess chocolate to drip off and eventually place the coated truffles onto a coating grid. 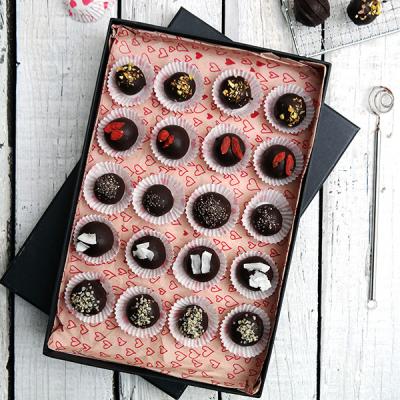 To finish off, garnish the truffles as you wish with pistachio nuts, goji berries, hemp seeds or chia seeds, then let them rest in the fridge overnight. Remove the truffles from the coating grid and store them in the fridge in an airtight container for up to 4-5 days (but they won't last so long). This recipe was created in cooperation with Stefania from excellent food blog La Tortoise.